Word on the street - Shag Collins Street store is having a sale. I called the store to confirm and the answer is yes, there is a sale on, not storewide, but certain jewellery and clothing items are now up to 70% off. For those that don't know, Shag is a notorious vintage clothing retailer with stores in Fitzroy, Windsor and Collins Street CBD. 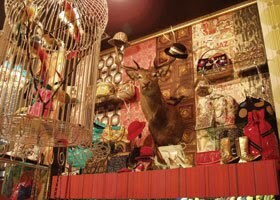 Vintage clothing, accessories and vintage inspired garments are for sale in these treasure trove stores.